But what is you have to work with the people you've got? Since you can’t constantly rehire and retrain, the most practical solution for most business leaders is to work with what you’ve already got and unlock the potential within your existing employees and teams. In this workshop, Colin will share practical and insightful new measures to create loyalty, performance, ownership, accountability and engagement from the ranks of your existing people. 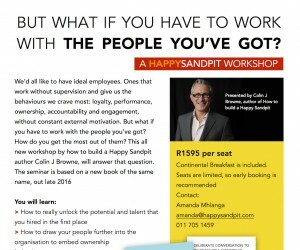 Where How to build a Happy Sandpit, Colin’s first book spoke about methods of creating culture and hiring to fit that culture, this fresh perspective deals with the practical matter of getting great results from the people who are already here. This is a must for any people leader. Space is limited and we encourage early bookings. 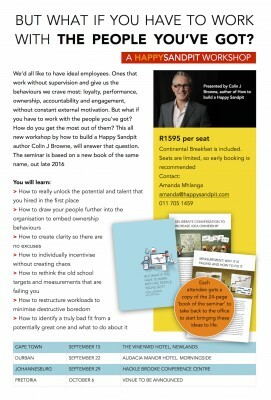 Workshops will take place in Cape Town, Durban, Johannesburg and Pretoria.